Idolaf Battle-Born is a Nord warrior and a member of clan Battle-Born living in Whiterun. He is fixated on the feud between his family and the Gray-Manes, as evidenced by his insistence that you choose a side as soon as you enter Whiterun. He clearly believes that anybody not supporting his family opposes them, and will chastise you for declining to choose: "Sooner or later, we all have to choose a side." Idolaf is clad in a set of Imperial light equipment. This includes an Imperial light armor, a pair of Imperial light bracers, and a pair of Imperial light boots. He is equipped with an iron sword, and carries a key to the clan's house, as well as a selection of common loot and gold. Like the rest of his family, Idolaf is an avid supporter of the Empire, and can be observed attempting to persuade local blacksmith, Adrianne Avenicci, to forge weaponry for the Imperial Legion. 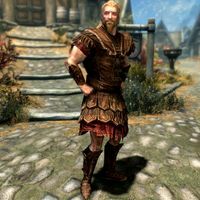 He refuses to contract Eorlund Gray-Mane for the job, stating that he would "sooner bend [his] knee to Ulfric Stormcloak." On first speaking to him, he will simply ask you: "Gray-Mane or Battle-Born?" If you respond by saying you support Battle-Born, he will say: "Then I say well met, friend. I could tell you were a sharp one the moment I laid eyes on you." If you instead claim to support the Gray-Manes, he will chastise you with: "Then you're either a Stormcloak sympathizer or a fool. Either way, you're no friend of mine." if you act confused, he will chastise you and ask you again: "Got stones in your ears? I asked what side you're on, Gray-Mane or Battle-Born!" Claiming to not understand the question after acting confused will have him explain in-depth: "New in town, huh? Whiterun's got two clans, both old and both respected. Difference is, the Gray-Manes turned their backs on the Empire and we Battle-Borns stayed loyal. So I'll ask again, Gray-Mane or Battle-Born?" After receiving an explanation, you can choose to not pick a side in the feud, to which he will respond: "Sooner or later, we all have to choose a side." When encountering Idolaf, he will make various comments about his hatred of the Gray-Manes: "Damn those Gray-Manes to Oblivion. They want to back the Stormcloaks, they'll get what's comin' to 'em." He will specifically refer to how his past relationship with Avulstein Gray-Mane has soured: "Avulstein Gray-Mane and I were best friends as children. If I see that traitor again, I'll throw him in jail myself!" He will comment on the superiority of the Imperial way of life, "The cold, frightening truth is that the Empire represents progress. Anyone who fears progress is a coward. " and will additionally claim the Stormcloaks are holding back Nord society: "The Stormcloaks are content to live in the past forever. No wonder the Provincials think we're all baseless savages." When ending conversation with Idolaf, he may proudly spout off a rallying cry to the Imperial cause: "Long live the Empire." or he will comment on the future defeat of the Stormcloaks: "The Stormcloaks are living on borrowed time, believe me." Idolaf's disposition towards you will change depending on the reply to his initial question. 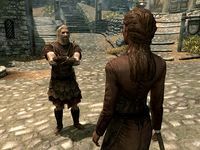 Should you reply that you support the Battle-Borns, Idolaf will remain friendly even should the Stormcloaks gain control of the city. This page was last modified on 1 January 2017, at 02:07.